Another weekend, another flurry of anti-legal aid stories finding their way into the tabloids. On the criminal legal aid front, The Mirror splashed outrage at the notion of Andrew Hill, the pilot acquitted of manslaughter following the Shoreham Airshow tragedy, “getting” legal aid to mount his successful defence at his criminal trial last year. It’s one thing when The Mirror – a market leader in legal aid trash news – whips its readers into uninformed apoplexy over criminal legal aid being granted to those who are, after a fair trial only possible because of legal aid, convicted. But it breaks bold new ground even for this organ to resent legal aid being granted to a man whom a jury has found to be not guilty. “Shamima Begum is on legal aid despite being stripped of UK citizenship”. In much the same way that the people I prosecute and defend are granted legal aid despite being accused of criminal offences. Or diabetes patients are treated on the NHS despite having diabetes. Shamima Begum is, of course, the tabloid ghoul du jour. A 15-year-old Bethnal Green schoolgirl fleeing her home country to join a terror cult abroad, and, four years later, intending to swan back in as if nothing had happened, is the stuff of a red top news editor’s wettest dreams. In February, Home Secretary Sajid Javid, in apparent defiance of his own Home Office advice and with a Fleabag smirk to the cameras, took the decision to revoke Ms Begum’s British citizenship. She is now appealing the Home Secretary’s decision to the Special Immigration Appeals Commission and is likely to be eligible for legal aid. Today’s Mail “scoop” follows allegations in The Telegraph that Ms Begum, while an “ISIS bride” in Syria, served as an enforcer in the “morality police” and sewed suicide vests onto her fellow jihadis, playing a far more active role in the group’s activities than she had previously suggested. The veracity of these reports is unclear, but let’s take as face value that they are correct, and that she was not merely a stay-at-home ISIS bride, but an enthusiastic accessory to the most appalling crimes against humanity. Would this make her despicable? Yes. Meritorious of opprobrium, disgust, contempt and fury? Yup. A criminal? Among the very worst. Deserving of legal aid? Without a shadow of a doubt. We’ve trodden these boards a thousand times before, but as the basics are yet to be learned by those with the biggest megaphones, they need repeating. Everybody – no matter what they have done or are alleged to have done – is entitled to equal treatment before the law. That is the building block not only of the rule of law, but of our entire democracy. You don’t earn equal treatment, or qualify for it through good behaviour. It applies universally. The day we start making exceptions for the people who offend us the most is the day our civilisation crumbles. Everybody is also entitled to a fair hearing where a legal decision has been taken which affects them. The removal of a person’s citizenship – a government telling a British-born citizen You have no right to exist within our borders – is one of the most far-reaching decisions the state can make. We do not want to live in a country where politicians can act with unchecked power; the rule of law requires that those affected have a route to challenge a decision and have an independent court review the evidence and decide whether that decision was taken in accordance with the law. In this case, while there will be a lot of material to which the public will never have access upon which the government will rely, there are obvious concerns on the face of what we do know. International law prohibits domestic governments from rendering citizens stateless. Ms Begum is a British national born and bred; the Home Secretary is relying on her supposed eligibility for Bangladeshi citizenship (through her parents) to comply with international law. Bangladesh is a country which Ms Begum has never visited and which, for what it is worth, has publicly rejected the notion that she would be granted Bangladeshi citizenship. It is far from certain that the Home Secretary has acted lawfully. It is obviously vital to establish that he has. This can only properly be done at a fair independent hearing at which the legal and factual arguments for and against are fully and competently presented. The Home Office will not spare any expense in instructing counsel to fight its corner (Theresa May was a fan of instructing multiple QCs for single cases to try to give herself an advantage). 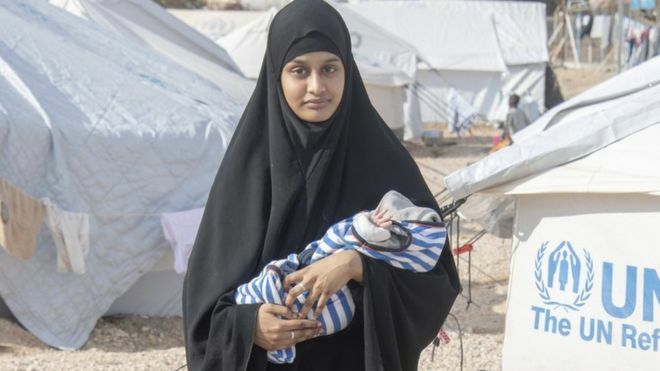 Equality of arms, another basic principle of the rule of law, requires that the citizen, Shamima Begum, be competently represented. As she is currently unable to pay for her own lawyers, lying destitute in a Syrian refugee camp, she will need to rely upon legal aid. Without legal aid, the case will not be properly argued; indeed, as she is currently banned from entering the country, without representation it will not be argued at all. Shamima Begum herself, of course, will not receive a penny of taxypayers’ money. Legal aid is claimed from the Legal Aid Agency directly by her lawyers. A grant of legal aid is also not a bottomless pit, despite what the tabloids falsely claim. It is paid at fixed rates set by government, far below market value – and usually far below what the state pays its own lawyers. And it is designed, like the NHS, to ensure that all of us have our basic rights and dignity respected, whatever we have done. We do not withhold publicly-funded medical treatment for criminals, terrorists or other social undesirables; we recognise that to do so would be barbaric, the mark of a country that has badly lost its way. So when the Mail invites its readers to fulminate and howl and ask Why should the public pay for this awful woman’s legal aid?, the answer that should be given – by our Lord Chancellor, preferably, as the person with the statutory obligation to uphold the rule of law – is because that is the price of living under the rule of law. If you’d rather exist in a society where the rules are not applied equally, where your entitlement to a fair trial is dependent on the whims of government officials or the roar of the effigy-burning mob or the deepness of your pockets, there are plenty of countries out there willing to oblige. UPDATE: A common response to this story today has been from people who, understandably, feel aggrieved that more attractive (or “deserving”) causes than Shamima Begum were denied legal aid. Inquests are a particular area where legal aid has been refused for bereaved families, but the non-availability of legal aid stretches across the justice system, from the family courts to employment law to housing to welfare to personal injury to crime to immigration and so on. Many, many people have been denied justice due to refusal of legal aid. But to attack the granting of legal aid to Shamima Begum is, with respect, to miss the point. The scandal is not that Shamima Begum is eligible for legal aid in complex legal proceedings carrying life-changing consequences, but that so many other people have had legal aid refused and removed as part of the appalling attacks on legal aid that successive governments have wrought. It is not party political – all three main parties in government have fed the lies about legal aid to the press and public that have purchased political cover for them to obliterate legal aid and prevent ordinary people from accessing justice. In the 1980s, 79 per cent of the population was eligible for legal aid. By 2015, this had plummeted to 25 per cent. Public anger should be directed at the politicians who have convinced us that cutting legal aid is a good thing, not the few people who are still able to access justice.